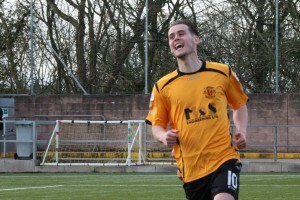 Annan maintained their push for one of the play off places with an important victory over Arbroath on Saturday. The margin of the Arbroath defeat however gives you a false impression of the way the game played out particularly in the first half when Arbroath were very much on the ascendancy but their lack of a cutting edge up front against a resolute Annan defence was their main reason for defeat. Annan on the other hand defended well soaked up the pressure particularly on the opening half and scored their goals at important times in the match which took the steam out of the visitors. The Annan team showed several changes from that which started in the previous weeks match against Elgin City with Black , Flynn and Omar all missing which presented starting slots for Swinglehurst, Breslin and Weatherson. It was the visitors who made the early running with their obvious threat coming down the left where Bobby Lynn and Darren Ramsey were a handful to the Annan defence and in the opening minutes Lynn’s low dangerous cross was well defended which set up Annan on the attack at the opposite end, where Weatherson’s effort went narrowly past the post. Almost immediately Fleming averted a dangerous situation intercepting a through ball aimed at the alert Lewis Guy. Todd came close when his 15 yard effort went narrowly over the bar. At the other end London picked out Greg Rutherford who headed over the bar from a promising position. It was turning out into an entertaining spectacle for the supporters with Arbroath forcing 3 corners in the opening 10 minutes. Josh Todd’s quick footwork in the 15th minute resulted in him making a surging run down the bye line cutting along the back line before finishing with a poor cut back from a very encouraging position. Annan opened the scoring in the 20th minute after a penetrating run by Martin McNiff down the left ended with a cross ball which Weatherson controlled only to see his shot crashing off the cross bar but Todd following up had the simple chance of heading the ball into the net from close range. It was a goal against the run of play but Arbroath replied 5 minutes later when Jamie Reid picked up Lynn’s pass to finish with a 25 yard thunderbolt into the corner of the net. Arbroath were back in the game but within a minute Annan struck again, the goal was very much down to the tenacity of Barry Cuddihy who intercepted the ball in the middle of the park and getting the break of the ball on the challenge with keeper Allan Fleming with the ball falling kindly for Lewis Guy who slotted the ball into the net from 10 yards. Arbroath responded forcing several corner kicks and it took a superb save from Jordan Hart when he denied Darren Ramsay with a full length diving save. Arbroath were pressing hard for an equaliser towards the end of the half and Annan had Barry Cuddihy to thank when he headed off the goal line following a corner from the left to the back post. Trailing 2-1 at half time the visitors were dealt a further blow right from the second half kick off when once again Josh Todd latched on to a ball played over the top of the Arbroath defence by Steven Sloan and Todd finished clinically with a low shot past Allan Fleming to give Annan a 2 goal cushion. Jordan Hart pulled off an instinctive save from an Andy Munro header following a corner in the 60th minute and at the other end Sloan played in Lewis Guy who was denied by an equally important save from Allan Fleming. Chances were few and far between, Weatherson’s long range effort in the 70th minute did not trouble Fleming and Rutherford’s effort at the other end went straight into the arms of Jordan Hart. Annan sealed the match in the 88th minute when Smart Osadolor reacted the quickest at the back post to prod home a corner swung in from the left after his initial header had been blocked. Arbroath were denied a late consolation goal when Hart pulled off fingertip from Bobby Lynn’s shot in the dying minutes. It was an important victory for Annan and keeps them in the play off places with 3 games to go. East Fife now only need 1 victory to secure the title following their victory over Montrose but with only one point separating 4 teams immediately below the Fifers the play off places will not be determined until after the final matches of the season. Annan’s remaining matches are at home against East Stirlingshire next week followed by a Stirling Albion away with the final match of the season at Galabank against Queens Park. ANNAN ATHLETIC : Jordan Hart, Ben Jago, Steven Swinglehurst , Martin McNiff, Peter Watson, Barry Cuddihy, Jack Breslin, Steven Sloan, Peter Weatherson ( Liam Park 85 min), Josh Todd, Lewis Guy ( S Osadolor 80 min) . Subs not used Blair Currie, Stuart McColm. ARBROATH : Allan Fleming, Mark Williams, Jordan Lowden, Ricky Little, Andy Munro, Mark Whatley, Bobby Linn, David Gold (Keiran Stewart 68 min),Greg Rutherford, Jamie Reid, Darren Ramsay. Subs not used Calum Broadie, Sergio Cecillia, Craig Johntone, Kane Hesker and Mark Walters GK.